One of the things I find myself doing on a regular basis is serving as a counterpoint to the fantasies running rampant in the defensive shooting world. I do this by bringing rational thought to the topic of personal defense, and today I’m doing it again! There are all kinds of problems with this notion, starting with a lack of perspective. How many times have you been suddenly awakened in the middle of the night by a burglar? If you’re like most people, none. Now how many times have you been awakened by a family member, or by severe weather which has also awakened others in the house? Probably more than once. In fact, for some of you it may be more than once just this month! The reality is that the vast majority of times you’ll be forced out of bed a bad guy will not be involved. The gun, therefore, is probably not the first thing you should be grabbing for; the flashlight is. 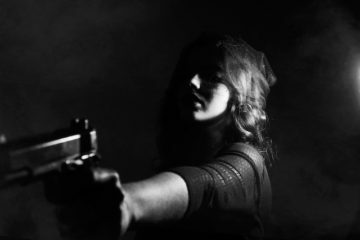 In the Hump Day Reading List over the last year I’ve chronicled several cases where homeowners, armed with a gun but no forethought, shot family members or neighbors after mistaking them for intruders. In almost every case, a flashlight and a loud “WHO’S THERE?” would have prevented tragedy. As you’ve no doubt experienced, your mental acuity after being jolted awake is usually not optimum. You’re likely to be more than a little hazy; your judgement is not what it is when you’re wide awake, carrying a gun on the street. Having a gun immediately to hand under those conditions is a recipe for disaster. Personally, I want the retrieval of that gun to be a cognitive decision in response to an identified threat (or a likely threat). Even the author admits this when she goes on to say that she doesn’t want the gun secured, because “fumbling around with a safe” is an issue after being awakened. Think about this: if you’re fumbling to open a safe because you’re half asleep, isn’t it more than a little dangerous to be fumbling around with a loaded gun? I’d say so; the chances of a negligent discharge while “fumbling” is raised substantially. The way to short-circuit both of these risks is the use of a modern quick-access lockbox. These keep the gun safe from unauthorized access, such as children, but still allow you to get to it quickly when you really do need it against an identified threat. That couple of seconds of cognitive attention reduces the chances of a mistaken identity shooting in that twilight between sleep and fully awake, and if you’re going to fumble I’d rather you do it with the lockbox than your gun! I can already hear the rejoinder: “that few seconds may be the difference between life and death!” If your security preparations are so sketchy that a bad guy can make it into your house and get to your bedroom undetected, leaving you only a second of reaction time, I submit that you have bigger problems to deal with. Pay attention to your early warning systems; do you have an alarm system to alert your to the presence of a criminal before he can get within arm’s length? I’m not talking about an expensive monitored system. I’m using the word alarm in its original meaning: a warning system. To be useful an alarm doesn’t need to autodial the authorities; it simply needs to alert you to something wrong so that you have extra time to react. Sophisticated alarm systems are cheaper than they’ve ever been and easy to install, even in an apartment. For those who can have one, a dog is still great way to identify intruders before they reach your bedroom. On the surface these kinds of articles seem to be useful. When you subject them to the realities of life, and add in the responsibilities of being a conscientious gun owner, their advice simply falls apart. Don’t get suckered into conclusions based on faulty reasoning — think about what you’re doing, why you’re doing it, and most importantly what the alternatives might be. * You’ll be safer, and the people around you will too! P.S. : I’m working on a new book that deals exclusively with this topic. I’ll have more to say as I get closer to the release date! Hey Buddy!, I found this information for you: "A gun on your nightstand isn’t the best idea, no matter who says so". Here is the website link: http://www.grantcunningham.com/2017/03/gun-nightstand-isnt-best-idea-no-matter-says/. Thank you.